After the crushing disappointment of last seasons 98 goal total and the fact we missed out on bettering my 100 club total I had to pick myself up, dust myself down and crack on. Actually I was really motivated for this season as it was only an injury that stopped a 100 goal season last time and with a better GpG ratio so I was hopeful that we could do better this year. We didn’t have much work to do in the transfer market again this year as the squad in banging. 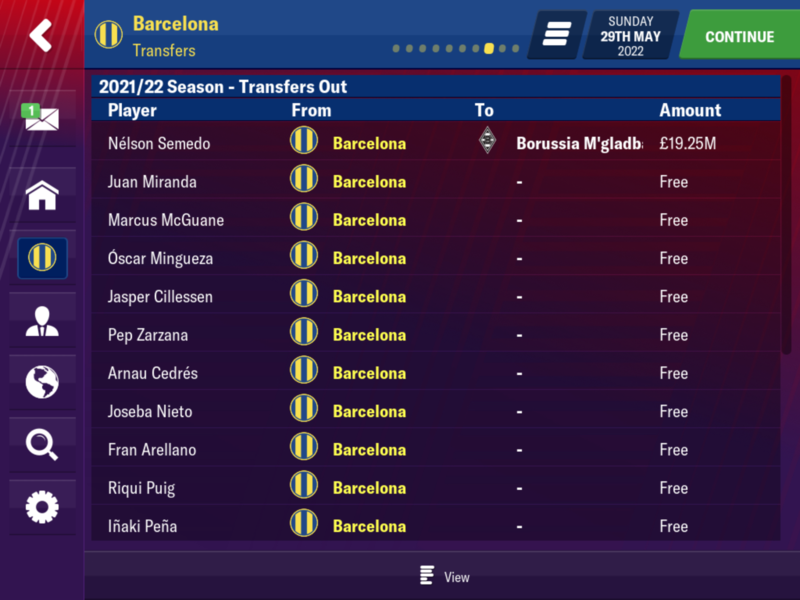 It was simply a case of replacing the players that wanted to leave. Only three players of any significance left the club this season with the biggest name being Busquets. 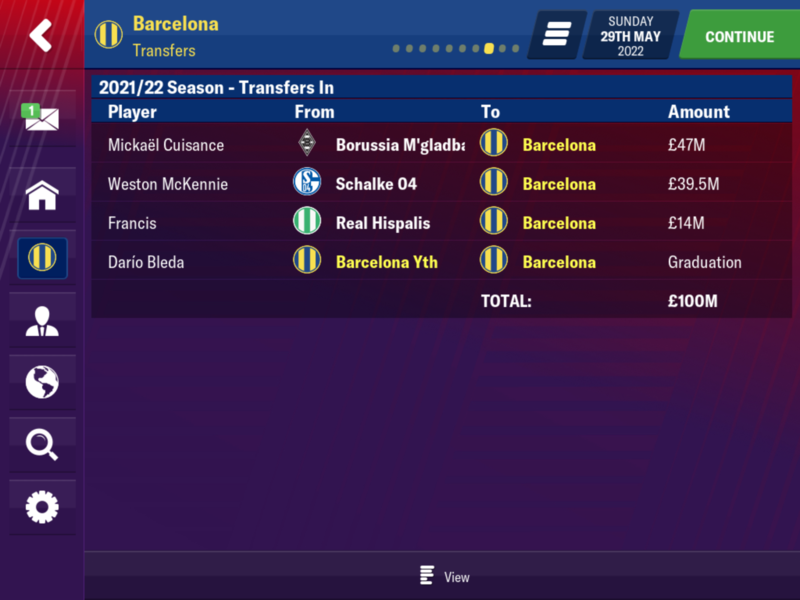 I replaced both Busquets and Langlet with Nikola Katic who can play both CB and DM and then I brought in Mendyl as a back up LWB. 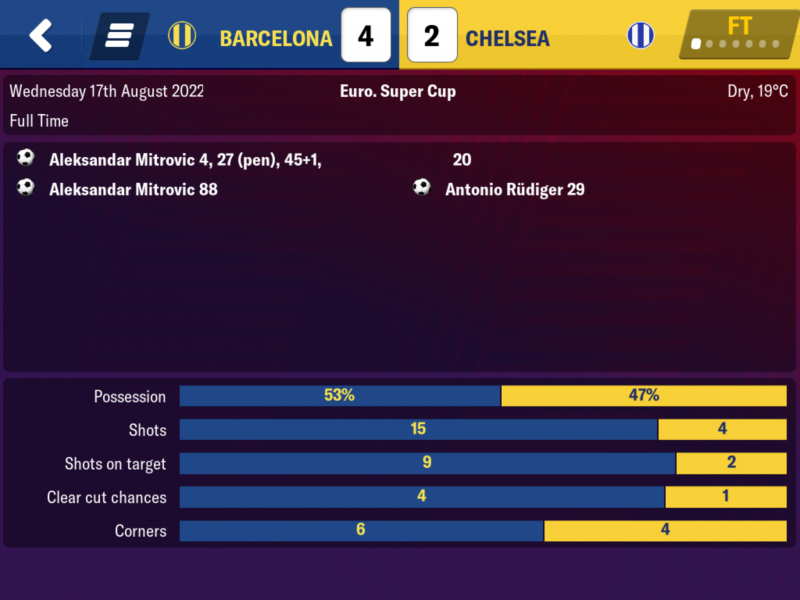 Last season we missed out on a clean sweep of competitions as we lost the European Super Cup to Chelsea which wasn’t a huge deal but it was annoying and it would be good to win the lot. We did collect this prestigious trophy this season following a win against Messi’s Arsenal. 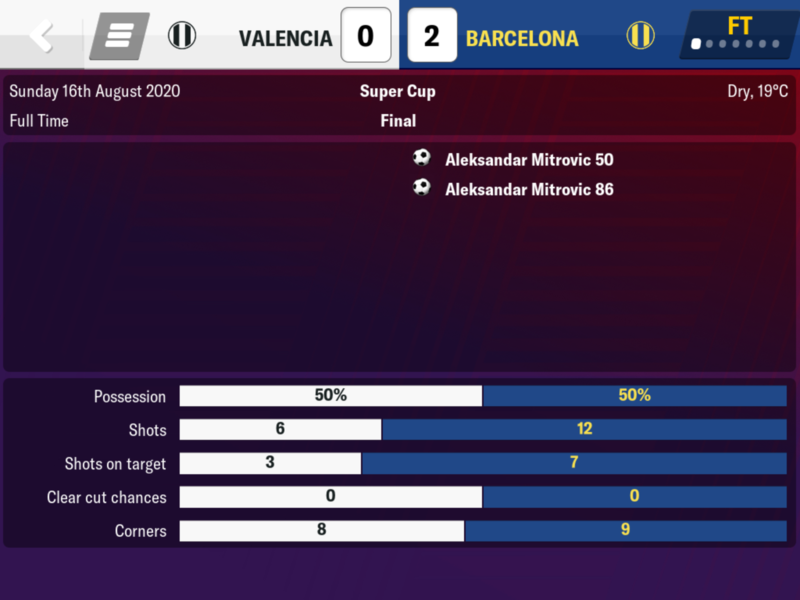 Another Super Cup and another brace from Mitro as we beat Valencia. 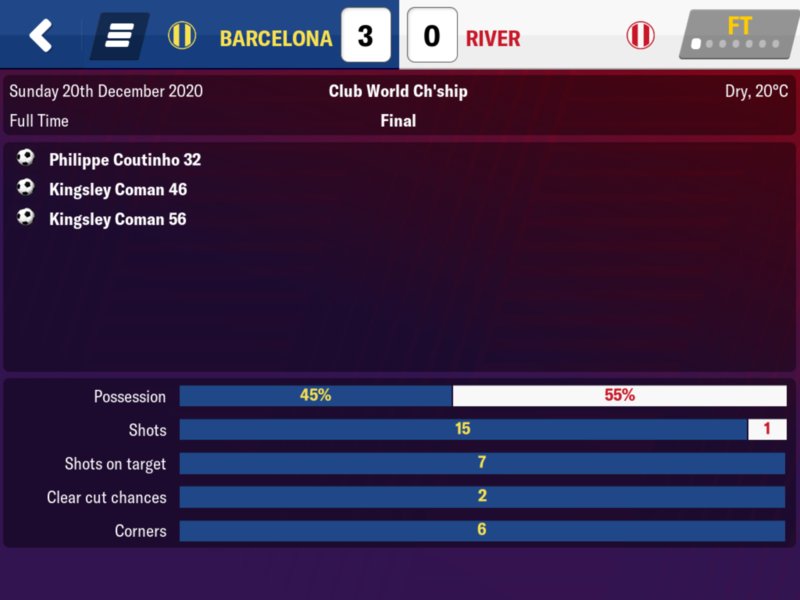 No goals for the big man as we beat River Plate to be crowned best in the world for a second season. 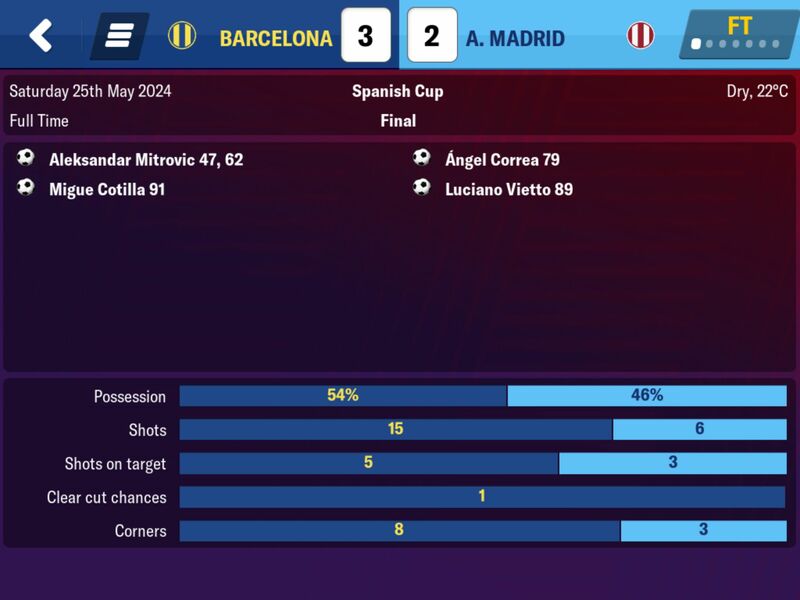 It was a Barcelona derby in the Spanish Cup final and we easily won thanks to Coutinho and Mitro. No great issues in the league and just 1 lose and 2 draws. 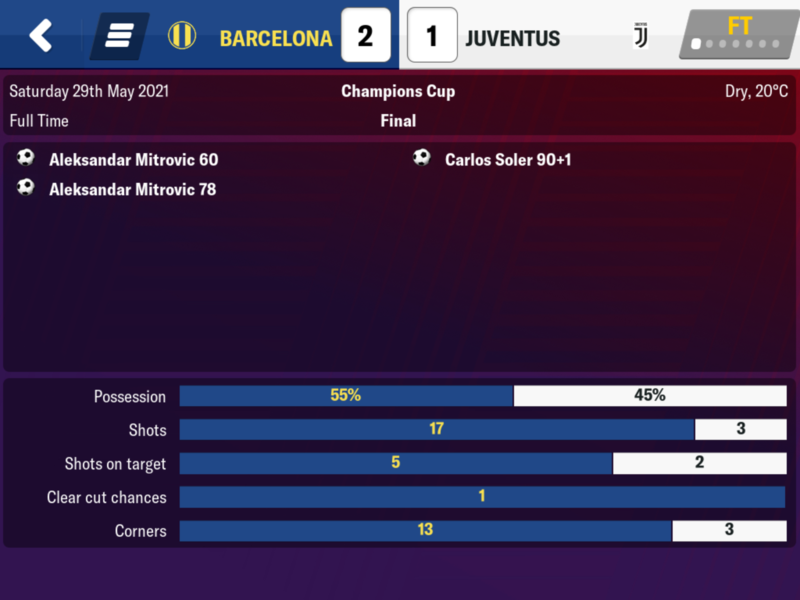 Juventus in the final and a brace from Mitro won us the trophy but how did that leave his season total? 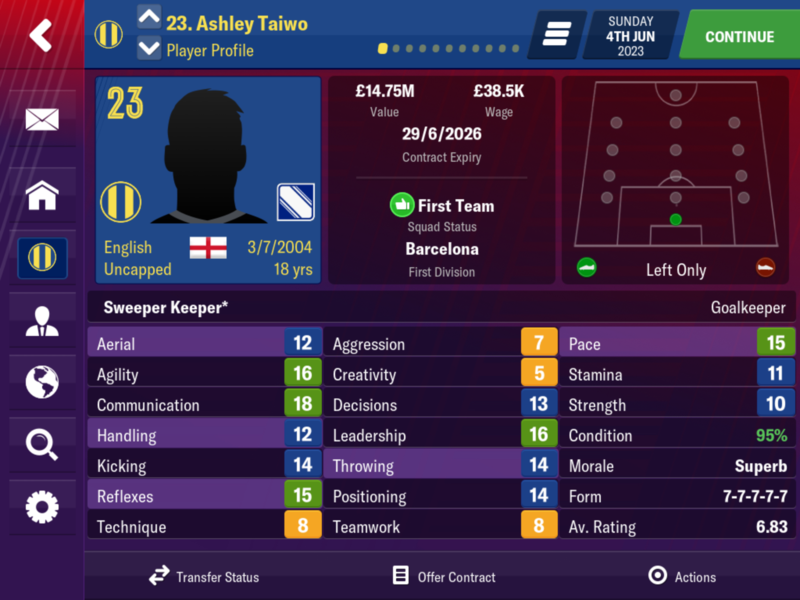 He is maxed out now which isn’t a surprise as he is 26 and bang in his peak years. His leadership did go up 1 point though which is interesting and begs the question of whether that is linked to XP and not his CA/PA. He had a small knock this year and missed a few games, in the end playing 58 games out of 64. 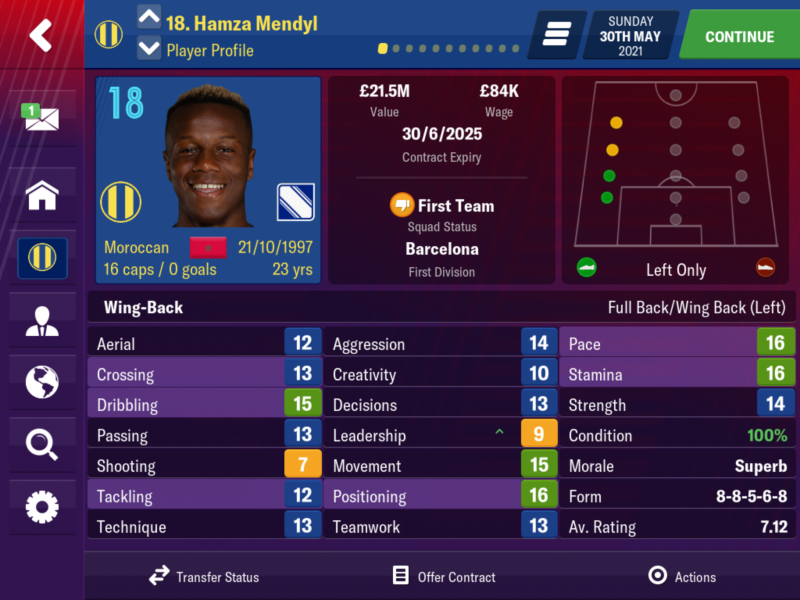 He hit the 100 goal total and went one over with that brace in the Champions League final which means he has a chance of improving our total. 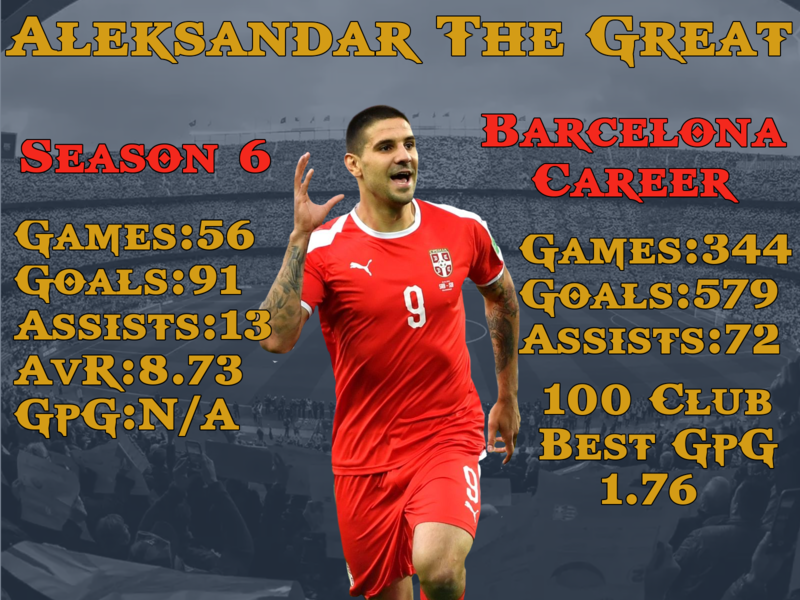 He was very close to season 1 GpG ratio (1.76) but he was just below it as he scored at a rate of 1.74 goals per game. It would have been good to improve our 100 Club total but the main thing is he hit another 100+ goal season and if he can continue doing that for the next few years we have a good chance of bettering our GpG total but also it keeps the chances of a the 1kc alive and maybe a 10 season 1kc. He now has 303 goals for Barcelona over thee seasons which is brilliant and is better than I could have hoped for at the beginning of this save. We carry on into season 4 in buoyant mood as this 1kc is looking very promising at the moment and with another 100 season under our belt perhaps next year we can push that 100 club total up a little bit. Three fairly good seasons. 😭 Nah, mate, really well done. Going to be interesting what he starts hitting in his prime and then his dwindling years. 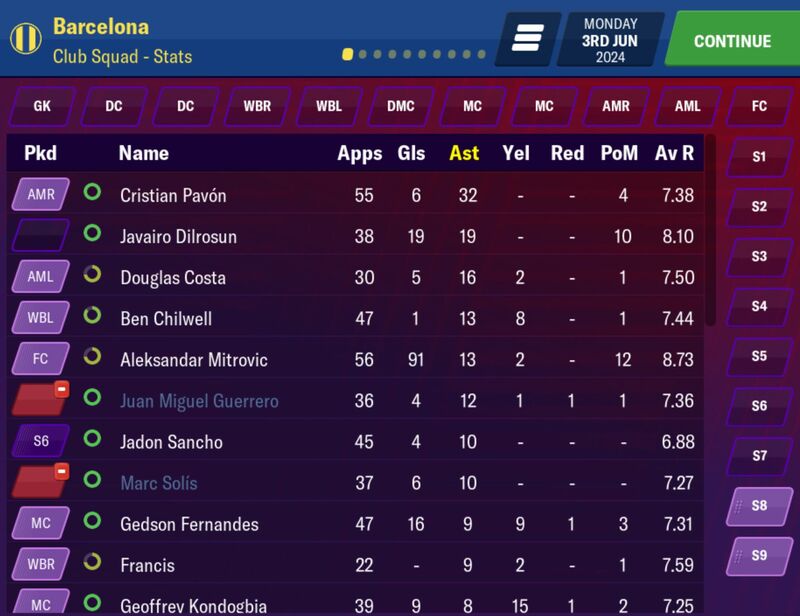 Another great 100+ goal season. 👍Hopefully he can keep this up for a few more years yet without any serious injuries! I was pleased with the season but it was just a shame I couldn’t up the GpG tbh. Hope the new update fixes the condition so this continues, going along great! Mitro is pretty much the perfect TM. Time will tell I guess as I have yet to play it with any update. 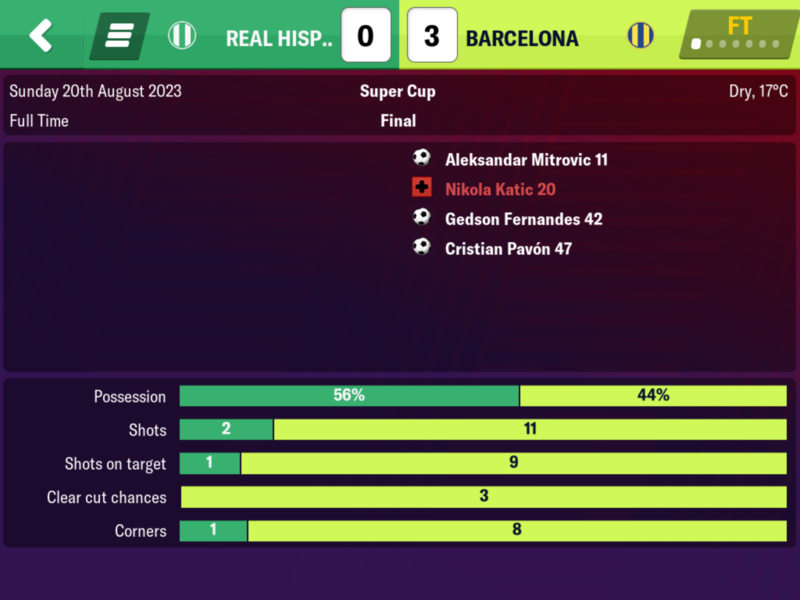 The initial response from those that have the hot fix make it sound like all isn’t lost and if I just need to take a little more care with resting and making sure I don’t over play him or tweak the tactic towards the end of the game then I do that’s not s big problem do long as Mitro keeps scoring. This season was played prior to the winter update/hot fix. This save has been cruising along in top gear since it started with Mitro banging in goal after goal including two 100+ goal seasons and another season when we were just 2 goals shy. At this rate we could be done in season 10 which would be awesome. 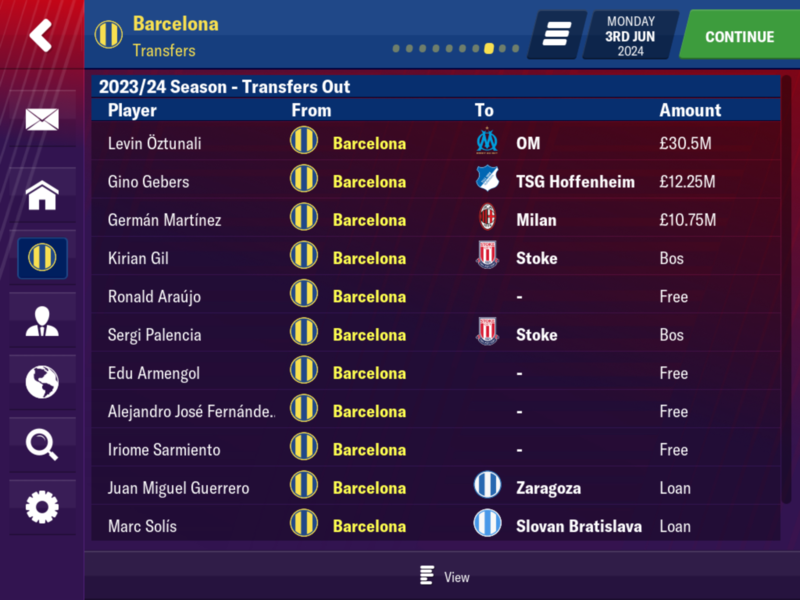 Only 1 player left this year and that was Nelson Semedo who wasn’t getting a game at RB. 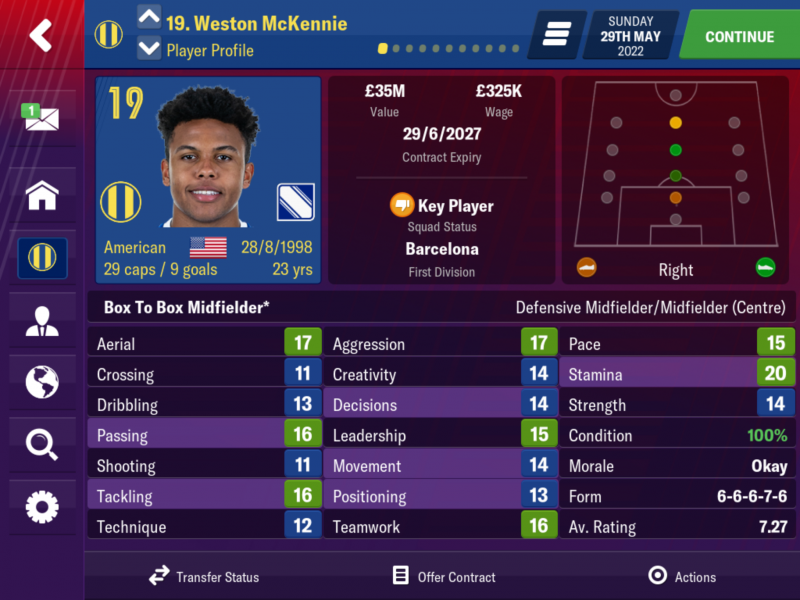 I brought in a couple of new CM’s this season in the shape of Cuisance and Mckennie with the goal that Cuisance would eventually replace Coutinho and Mckennie would take over from Kondogbia. 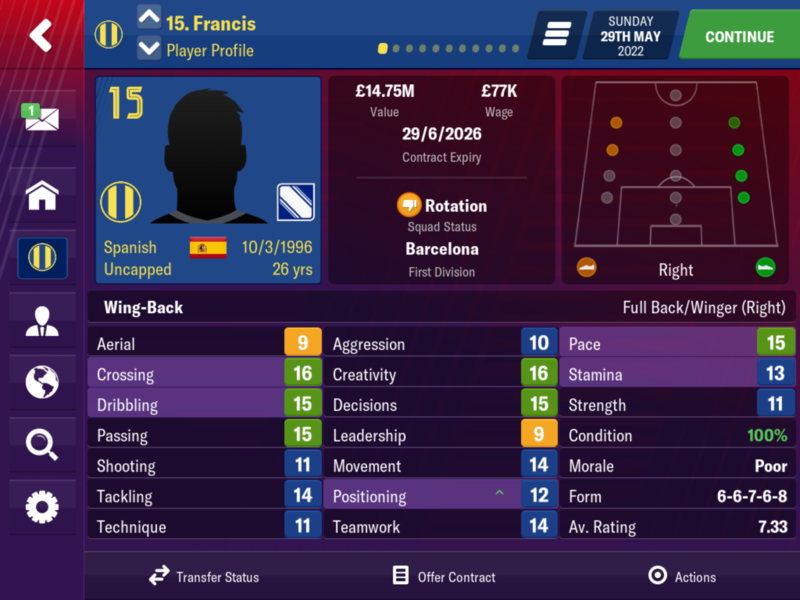 Francis is a back up RB to replace Semedo. 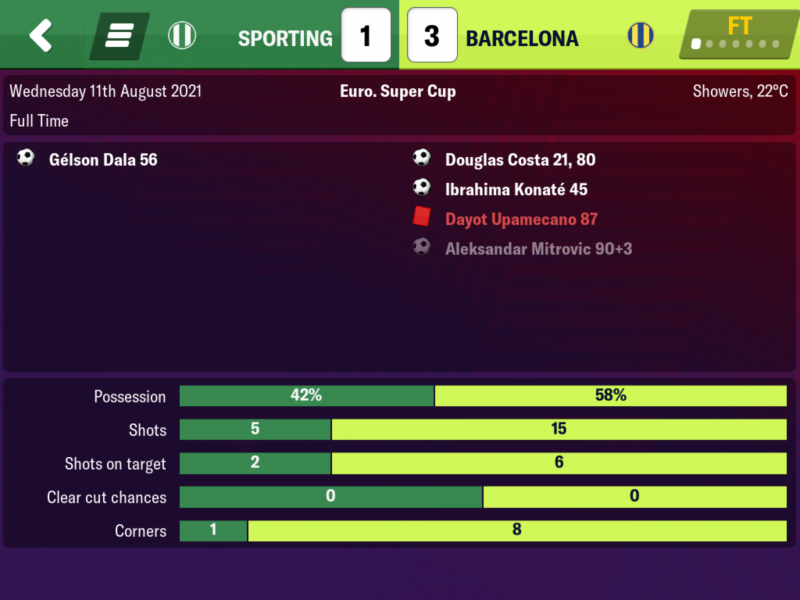 In the first 3 seasons we have won all the major trophies with just a lose in the Euro Super Cup being the only blemish. That wasn’t the case this season. No issues in this competition this season. A Barcelona derby win, a trophy and Mitro with his first goal of the season. 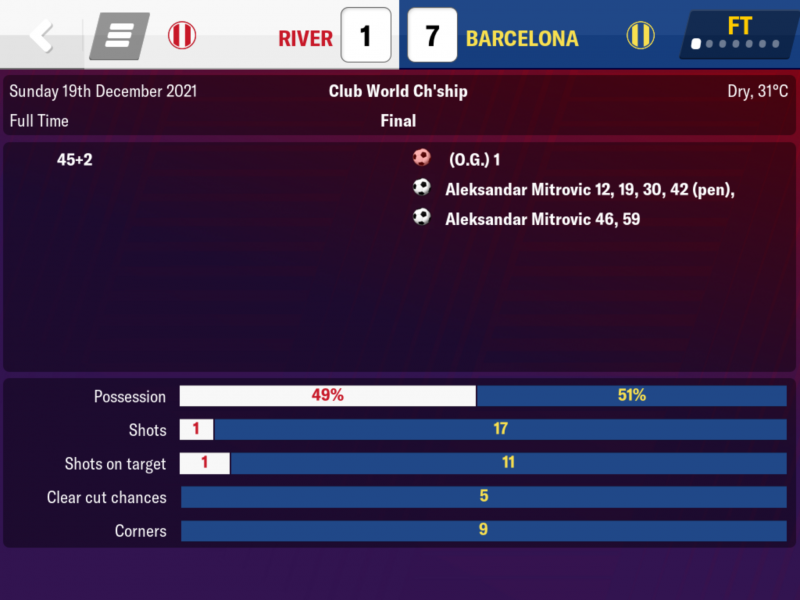 Mitro was in the mood against River has he knocked in 6 of the 7 goals. What happened here 😱 Diego Costa took the limelight away from Mitro as Atletico won the cup. No worries in the league as per usual. 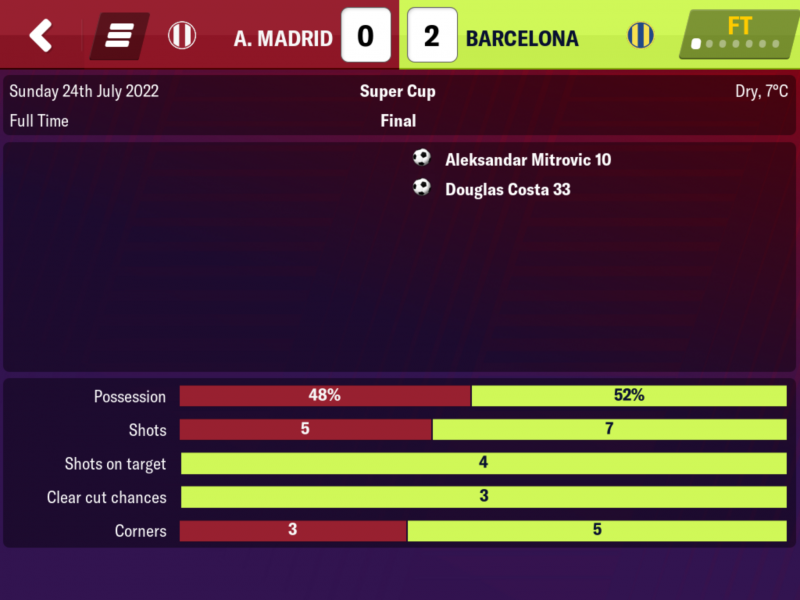 We made it a hat trick of Champions Leagues. This season is a good example of something that it’s important to remember if you plan a 1kc for yourself. More games played doesn’t necessarily mean your player will score more goals. Mitro featured in 62 games this season meaning he only missed 2 matches all season. 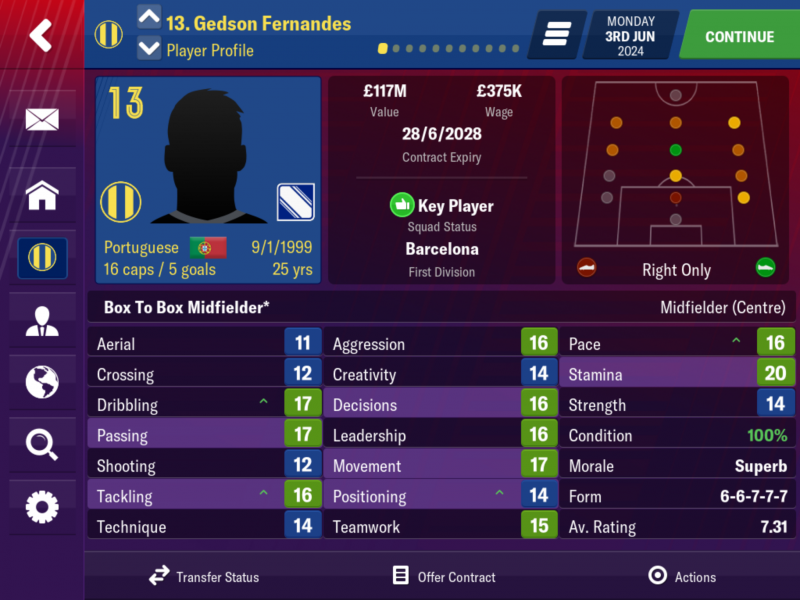 He very rarely plays the full 90 minutes for me as I will rest him for the final 10-15 minutes just to make sure he is fit for the next game especially if he has got 2 or more goals in a match. To prove that fact his understudy Fullkrug played in 37 games with 2 starts and every other appearance being as a sub for Mitro. 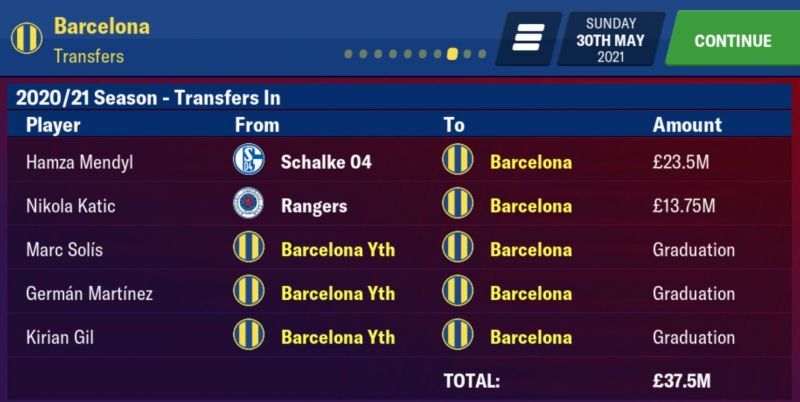 In those 62 games he managed to get 91 goals. That is 10 goals less than last season even though he played 4 games more. 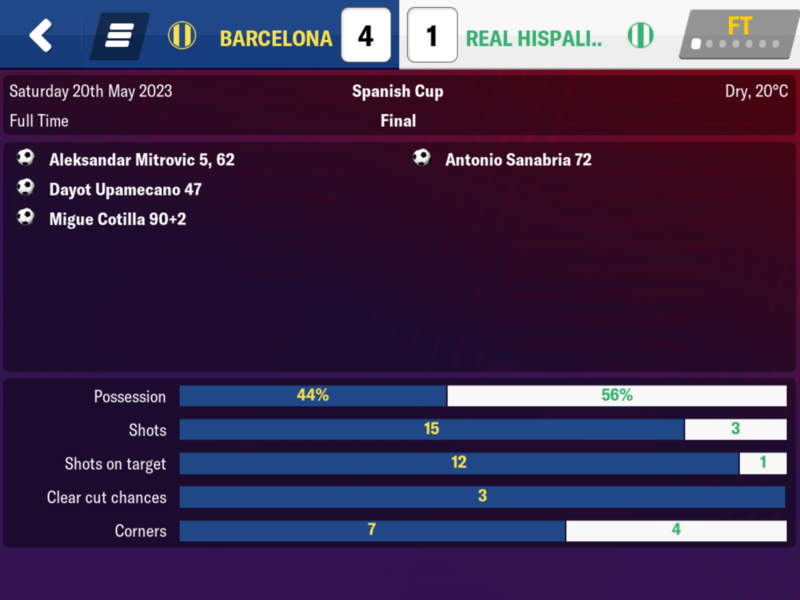 It’s a simple fact that I over played him despite him being subbed off and as I reached the final few games of the season the goals had dried up by his standards with just 5 goals in the final 6 matches of the season. 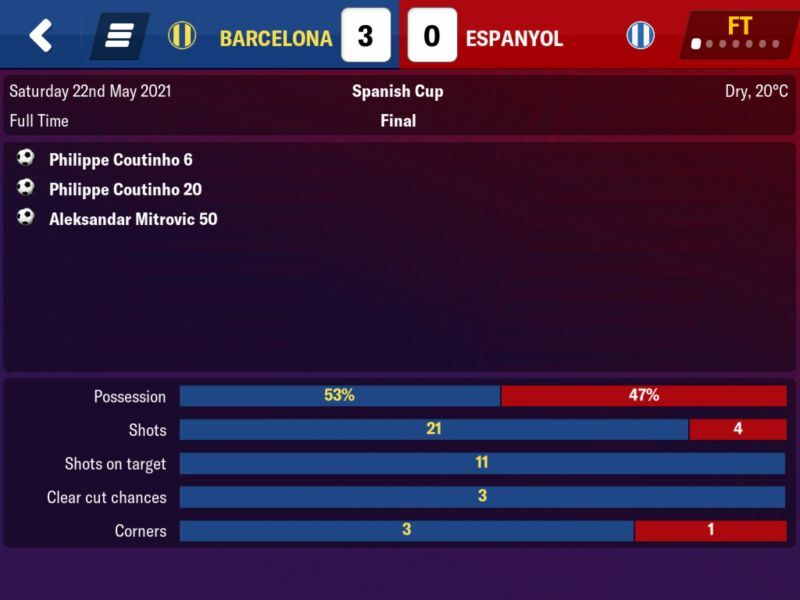 He still has 394 goals in 4 seasons so let’s not get too hysterical here and 90 has always been my minimum target each season so he beat that by 1. We are still well on course with this and hopefully this is just a blip season and he will be getting much nearer 100 goals again the next few seasons. Interesting season. He certainly likes the CWC. Regarding overplaying, in my Fabled I’ve been testing a theory. 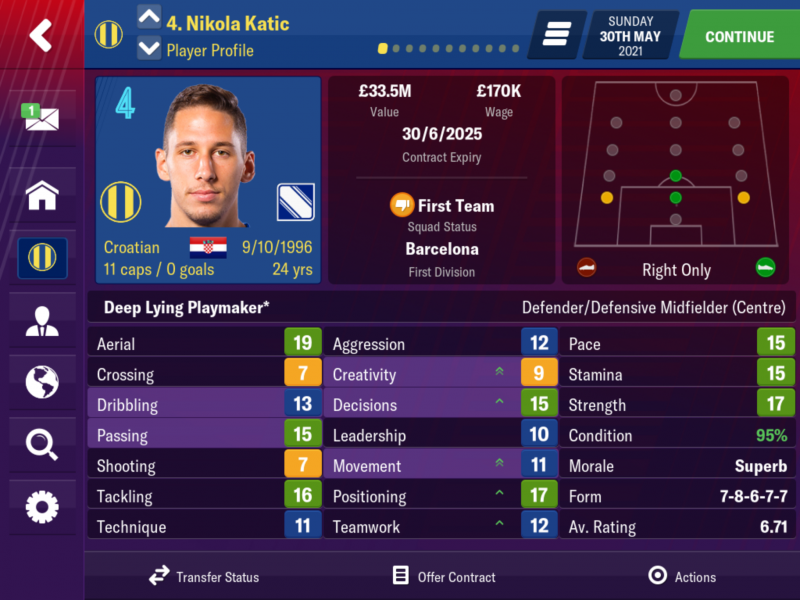 I tend to sub my main player off when he is at less than 80. However I decided to let him continue if he was playing well and then I’d rest him or just play him in a half of the next. It seemed to work. What’s your sort of findings? I nearly always sub once he is between 80% and 75% condition in a game unless it is early in the season and he will be getting back up to fitness quickly after a match. 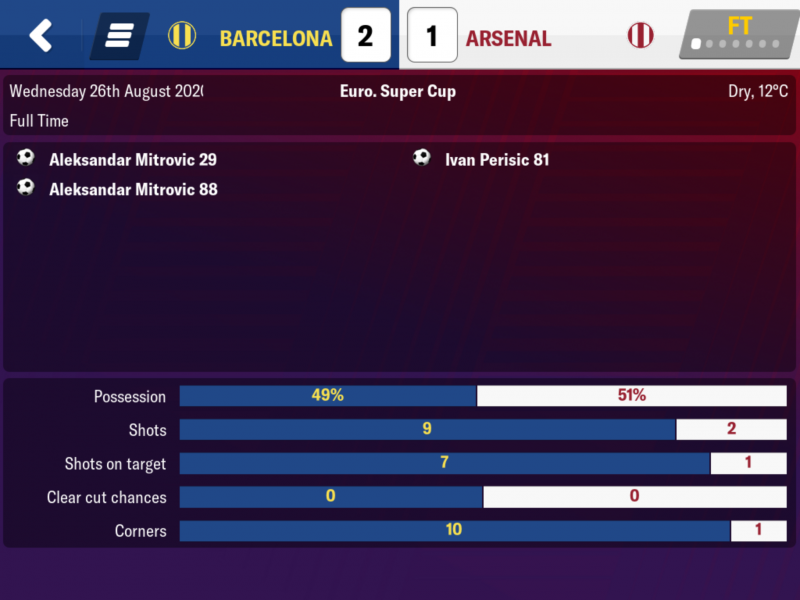 This was one of those rare seasons when he didn’t get an injury so I just kept picking him and he never went below 96% before any game but I think it is clear he suffered towards the end of the season. Around Xmas he was scoring at a rate of 1.82 GpG and even at the end of March he was at 1.75 yet he ended with a rate of 1.46 GpG. Another blinding season there Foxman...can't fault ya. I remember the disappointment you had with this season, utter madness as that's first class! It might not be 100+ but it's close enough! All falling apart here. Excellent. 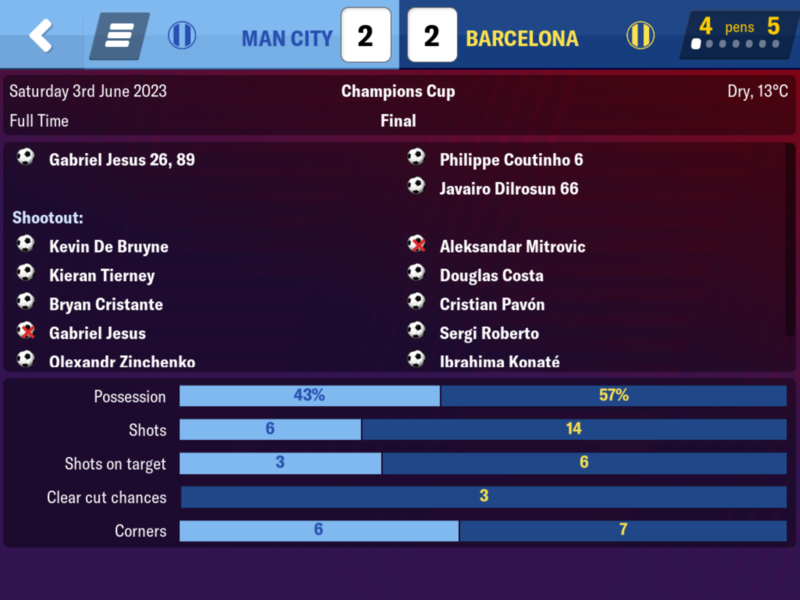 This is the final season I managed to play before I had to update, actually the final few games of the season were played on the update but this also could be the final season before this save goes belly up! Last season Mitro played far too many games (61) and only managed 91 goals. Yes a decent total but not out if that many games so this season I needed to make sure he sat a few out even if he didn’t get any injuries. A knock meaning he missed a couple of games and then the update in the final few matches meant he didn’t play as many games this year. In the end he appeared in 54 matches and despite not hitting a ton he did score at a rate of 1.74 GpG so a couple more games and he would have got us another 100 goal season. In the end he scored 94 goals so better than last season especially as it was in less games. 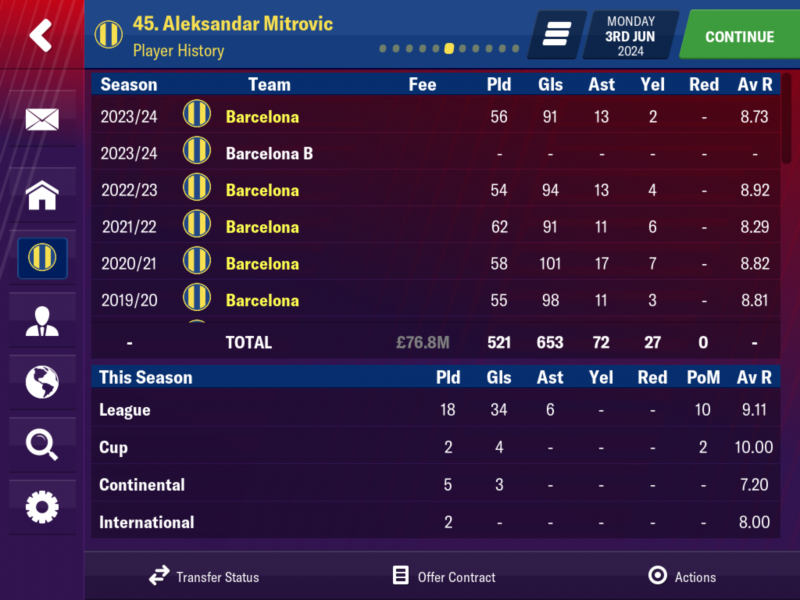 He is now in 488 goals for challenge so potentially we could be looking at a 11 season 1kc. This save is massively in the air now as so much depends on the hot fixes and how they leave the game. Simply if Mitro can’t get on the pitch often enough he isn’t going to get the total of goals needed to get the 512 goals we need for the 1kc. 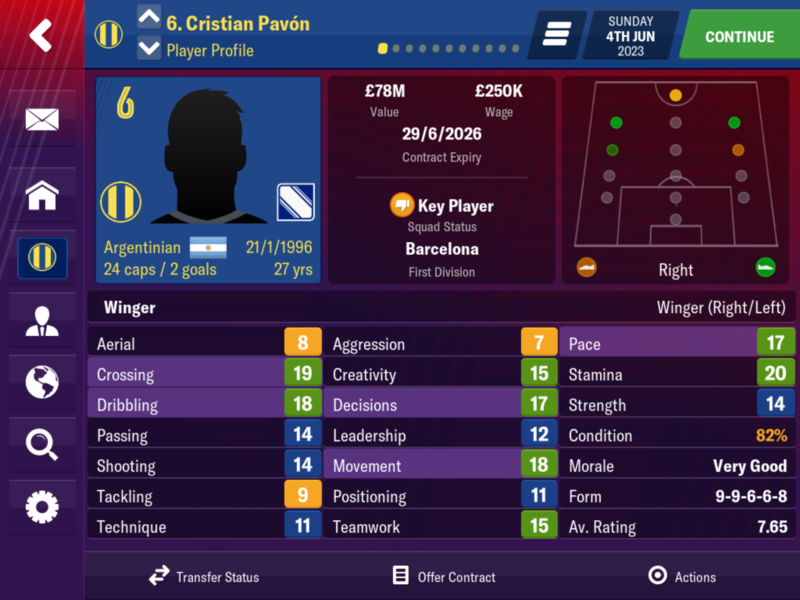 His age is also a factor as he turns 29 next season and beyond that it depends on what kind of decline we see in his early 30’s. The winter update has definitely made this “risky” 1kc even riskier. 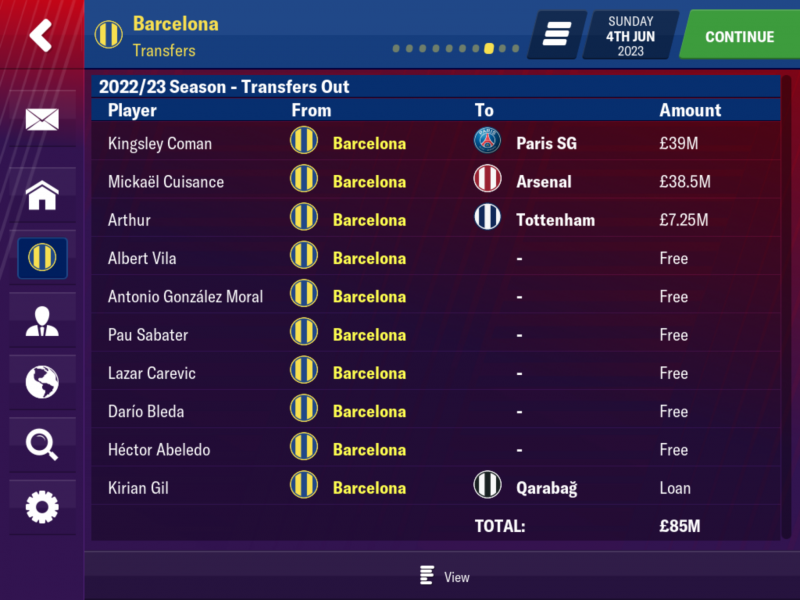 Coman might seem a strange sell but he was stealing too many goals from Mitro last season and wasn’t creating huge amounts so off he went to PSG. Cuisance never really cut it so I let him go and the same with Arthur. 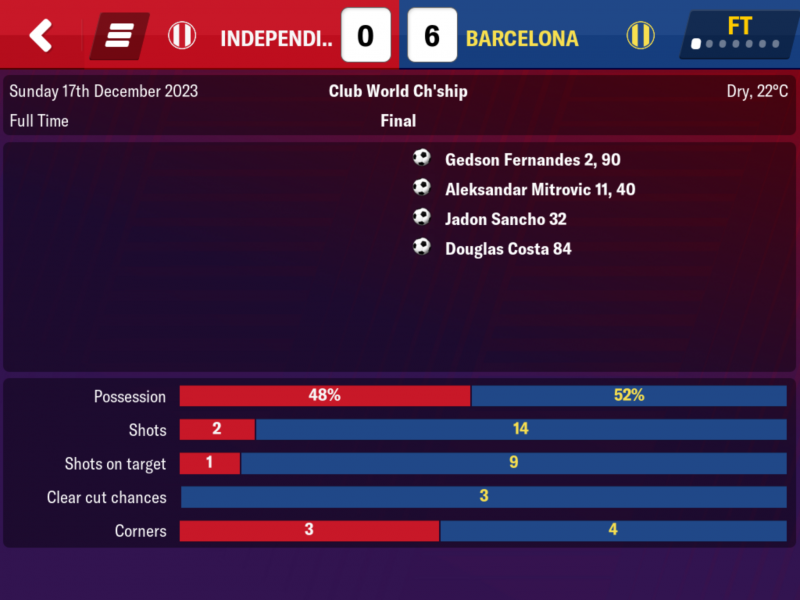 This was the weird season with the winter World Cup so no World Club Cup this year unfortunately as that can be a good source of goals. Another great season! Good luck in the next few. 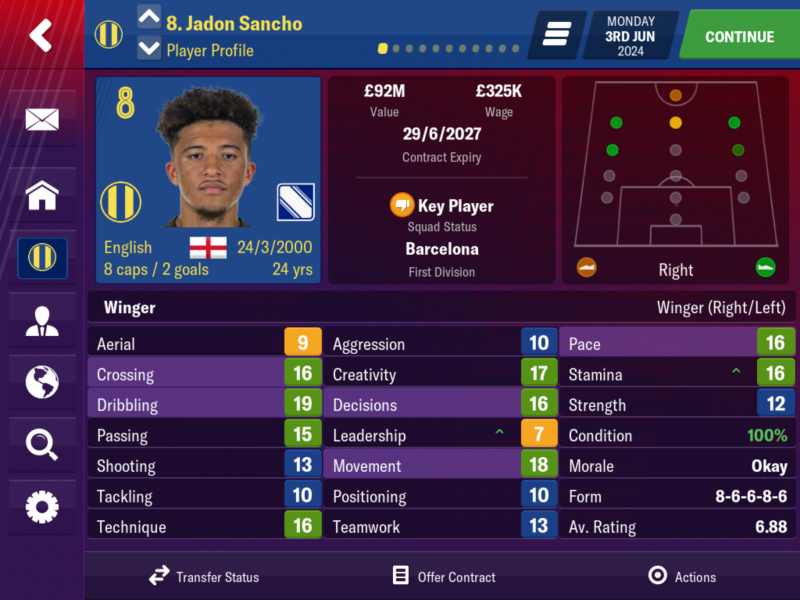 Hopefully you can get him on the pitch enough! Great season mate! The fitness thing has really screwed some challenges but hopefully you’ll be ok.
It’s definitely drama but it would be better if it wasn’t being caused by the devs making major changes to the game half way through that games cycle. Hope so mate. So much depends on how he degrades once he is over 30 but hopefully we can get a couple more 90 goal seasons before that point. Time will tell I guess. If I can get him at least 80+ goals a season for the next few seasons then maybe the 1kc could still be on. Loving the will he won't he but playing a save like this knowing what's happened must be demoralizing :(. Saves can naturally stutter but that happening due to bugged updates is shocking, hopefully you can breeze passed this issues! Pre update you're storming it though! 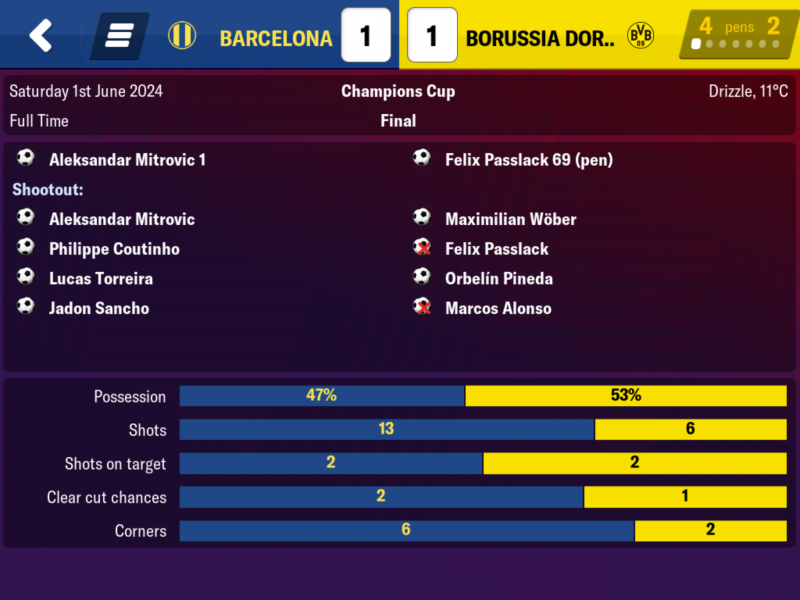 Loving this save soo much. 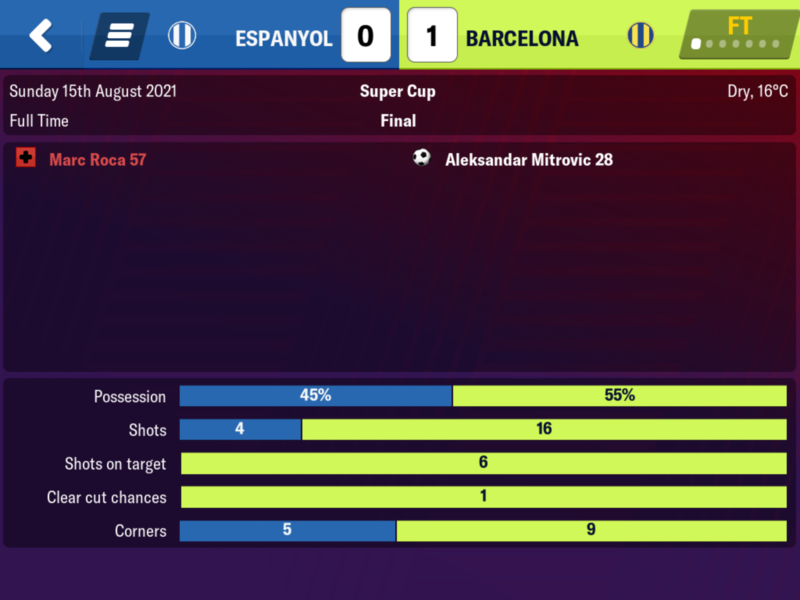 Mitro is on fire baby! 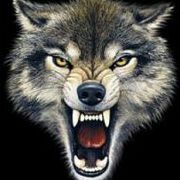 Get the new hotfix @Foxy if you dare. apparently its loads better but don't quote me on that. Ive downloaded the game to my tablet so i will give it a run and let you know bud. Season 6 will be played on the hotfix and I’m hoping it isn’t a hot mess. Although of course it will depend on the hotfix situation. Hope it doesn't mess it up. Not sure about cruising it but it looks possible at the moment unless updates screw it but time will tell on that. This season was played entirely on the first hotfix (10.2.1). I was nervous going into this season as we had come so far with Mitro in 5 season and I really didn’t want to find the hotfix had killed all hope of a 1kc with him. 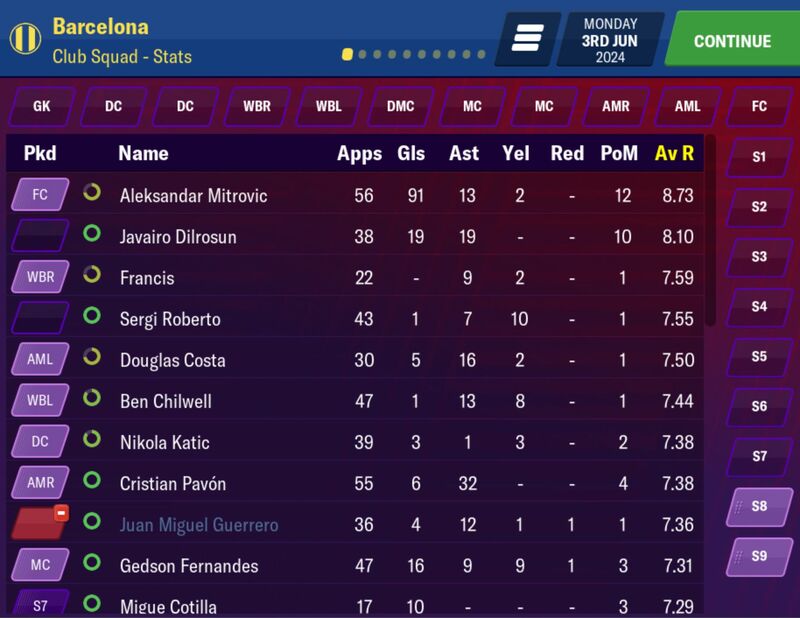 I tend to play Mitro for the full 90 for the first couple of months of a season and then start subbing him after 70-75 minutes beyond that point or once he has a hat -trick. 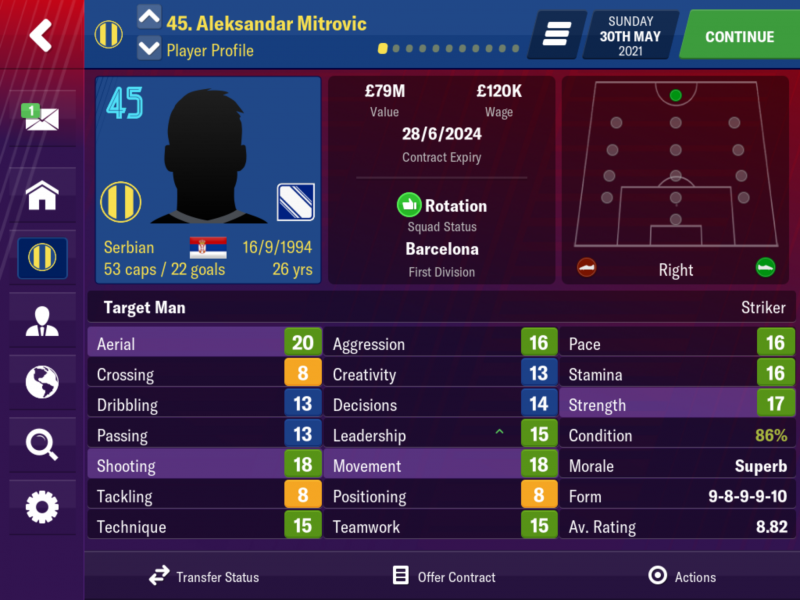 With this being played with the update I started with my sub policy from the very start of the season so Mitro never played the full 90 in any game this season. In a couple of games he came off in the 1st half or halftime as he had a hat-trick and that gave him a chance to play the next game. 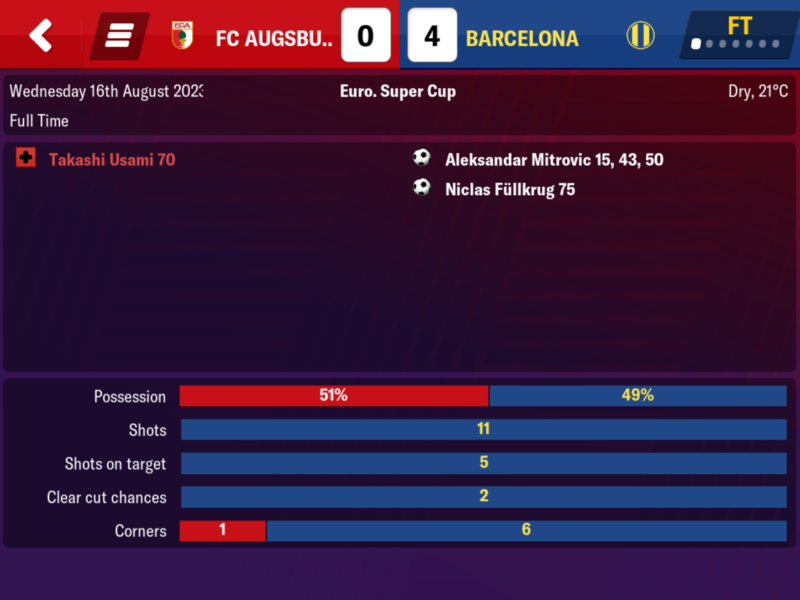 I also toned down the pressing on my tactic to own half but I’m not sure if that made much difference to how tired my players got but it didn’t effect the results so I have stuck with it. In the end Mitro made 56 appearances out of a possible 65. This was 2 more than last season and very much on a par with the number of appearances he has been making all save. I agree with @Ashez that we should have a minutes played stat as I think if we did that would be well below what he has played in previous seasons. If we say he played an average of 65 minutes in every appearance he made that would be 3,640 minutes of football. That translates into him playing 40 full games this season which I am certain is probably 8 to 10 games less in terms of minutes compared to previous seasons. 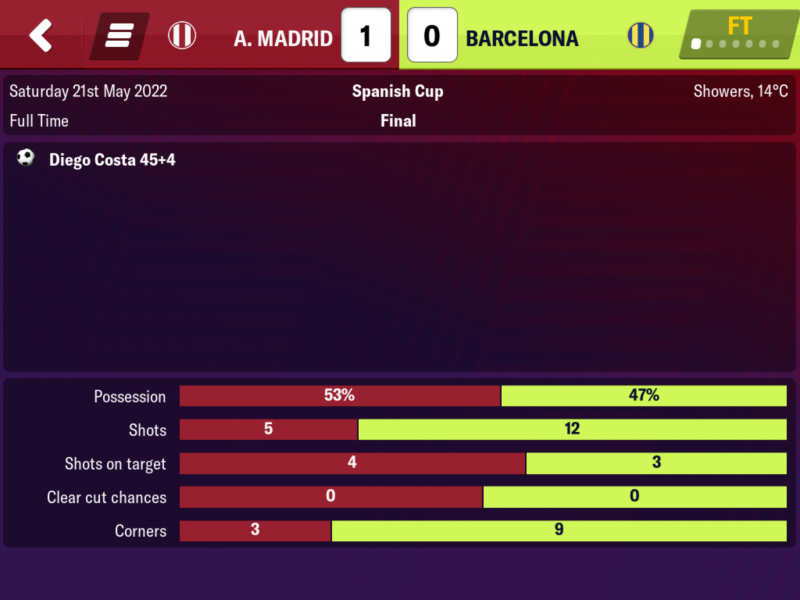 I never played him if his condition was below 94% but he played a couple of games at 94% when it was against an easy team and he could rest against a better team in the next match. 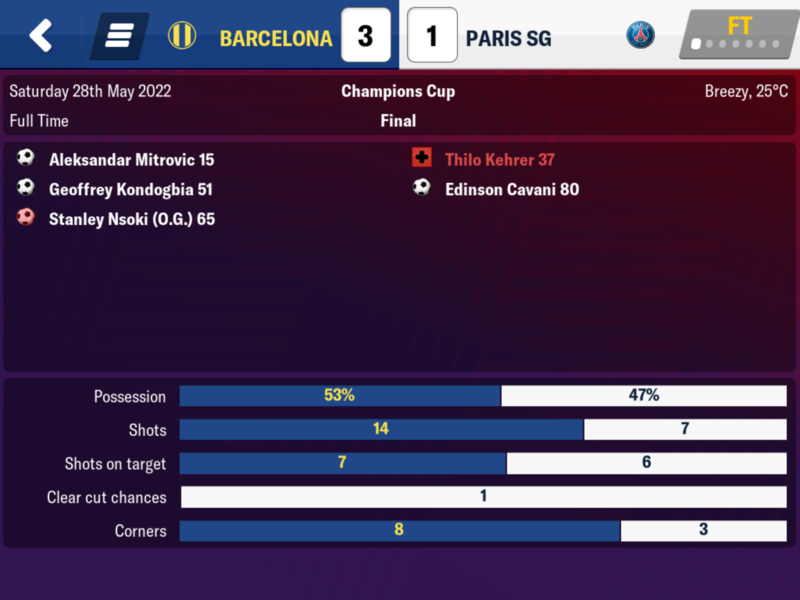 So the big question is how many goals did he get? 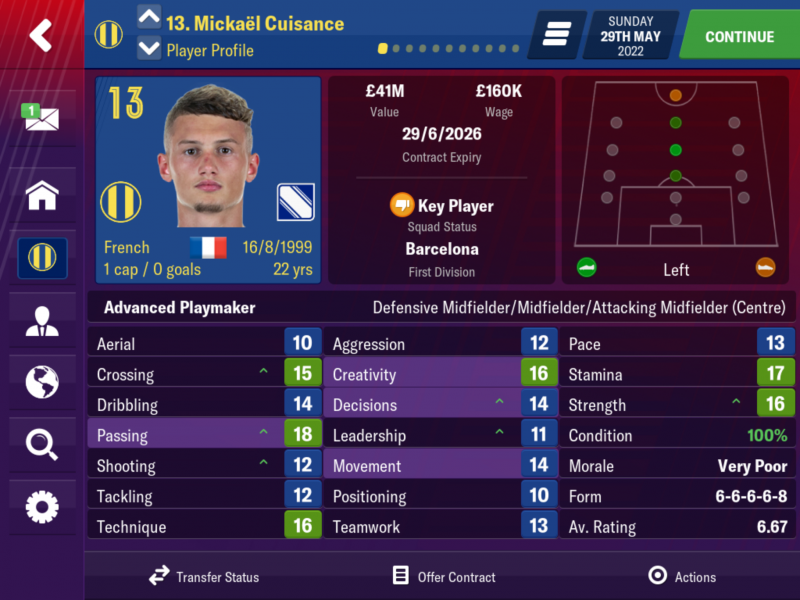 I accidentally demoted him during the season when I clicked the demote instead of player interaction which is why the numbers are low in the breakdown at the bottom. I am absolutely delighted with this total. 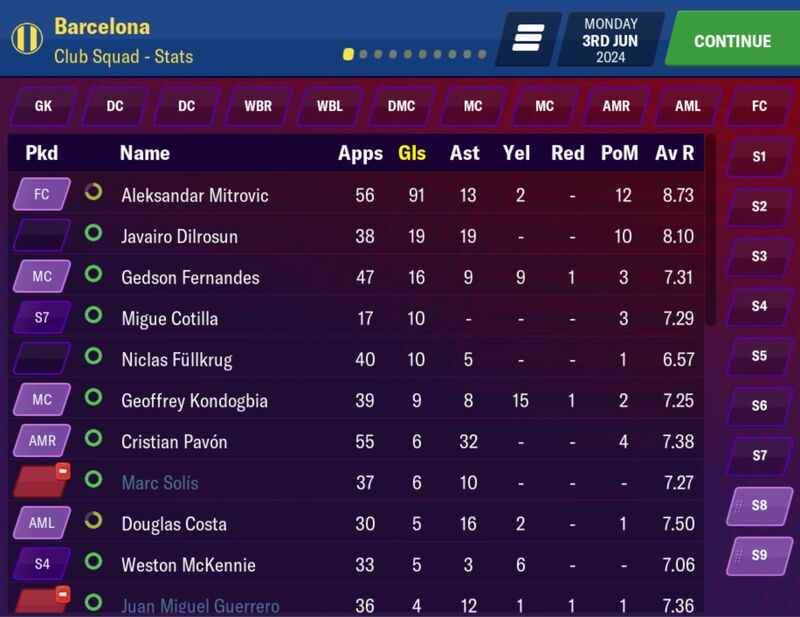 Yes the season was a bit of a grind at times making sure that I kept players and especially Mitro fresh and making sure I always knew which games were coming up next. That’s to say that for example if he was getting tired and we had a game with Eibar next followed by a game against Real Madrid he would play a good number of minutes versus Eibar and then rest against Real. 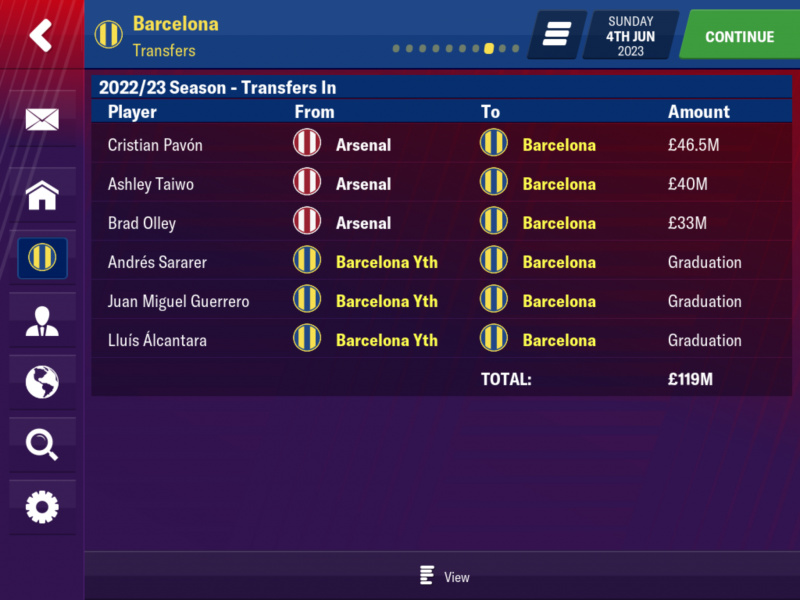 We are at the stage of this save now were we can start working out how many we need a season to complete the 1kc. 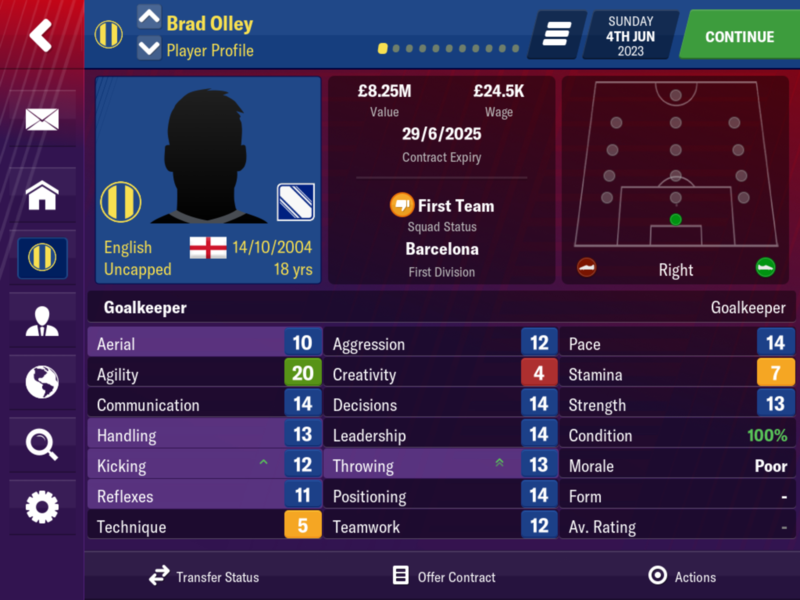 Any chance of a 10 season 1kc are gone now which is fine as I can’t see him getting any more 100 goal seasons but an 11 season one is still in reach. He needs 421 more goals so. 421/5 = 84.2 goals a season needed. So let’s call that 85 goals a season for the next 5 seasons. That would take him nearly to his 35th birthday so it is unrealistic to hope that he will still be hitting 85 goals a year by season 5 but if he can get 85 or more goals a season for the next couple of seasons we might just need to hope he plays into his late 30s. 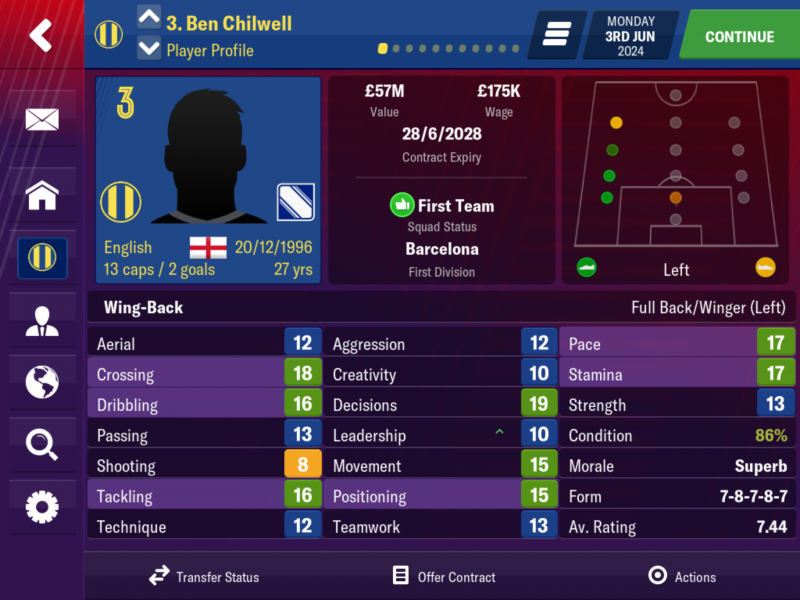 So the new aim each season is to get him to 85 goals and then every goal after that brings the next seasons aim down a little and is a big bonus. I think this save is still very much alive and kicking but a lot depends on how quickly he declines. 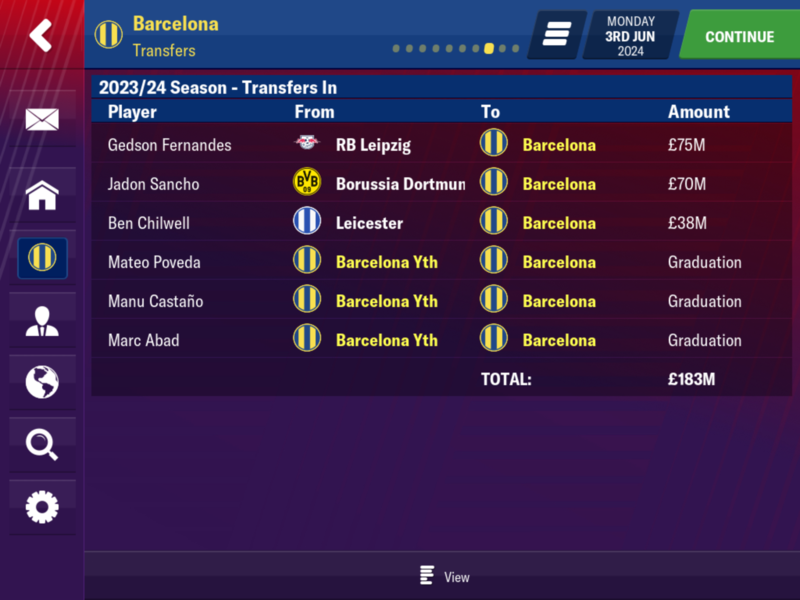 Just a small amount of business again this season but some bangers joined with Sancho, Chilwell and Gedson Fernandes. It was another successful season on the pitch. This was the only season that I played on hotfix 1 and season 7 will be played on the hotfix that was released this week.